Red wine appears elegant in a fluted crystal goblet, yet it's considerably less attractive on your walls. When some unsteady hand splashes a vintage burgundy onto your wall, get past your "Yikes!" moment and commence a cleanup immediately. 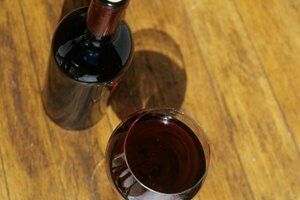 By acting quickly, you can remove the red wine from the wall before it becomes a lasting stain, using readily available household cleaning materials. Grab some dry paper towels and start blotting immediately after the spill to keep the wine from spreading down the length of the wall. Dab, don't rub; rubbing pushes the wine deeper into the wall's surface while also causing the stain to spread. Follow up by dabbing the affected area with a clean, damp rag to draw the wine out from the wall. In many cases, these simple steps may completely remove all of the spilled wine from the wall. If the wine remains visible after blotting, bleach the red away using a mix of clear dish soap and household hydrogen peroxide. Apply the soapy compound to the stained area using a clean dish towel. The mixture is thick enough to adhere to the wall, so leave it in place for a few minutes before wiping it away. Then gently rinse the peroxide mix from the wall with a wet paper towel, and dab the area dry if the red color is gone. 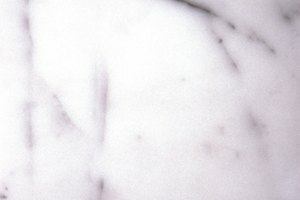 When stronger solutions become necessary, try bleaching the red stain away with a sodium percarbonate cleaner -- also known as an oxy-bleach, and sold under a variety of brand names that include O_xy._ Unlike a chlorine bleach, an oxy-bleach can eliminate the wine stain without affecting the color of the surface beneath. Soak a clean cloth in room-temperature oxy-bleach and press it against the stained area for five minutes. If the stain is gone when you pull the cloth away, gently rinse the area with a wet cloth, then pat it dry. If the stain has only partially faded, press the cloth against the wall for another five minutes before rinsing and drying the surface. If you don't have an oxy-bleach on hand, try a liquid laundry detergent or a laundry pretreatment spray. 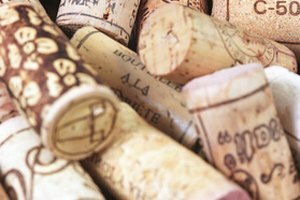 Wine shops supply a wide mix of wine accessories, including sommelier supplies such as corkscrews, crystal goblets and specially formulated wine stain cleansers. These inexpensive, spray-on treatments may be the most targeted method for restoring wine-stained walls to their original appearance. 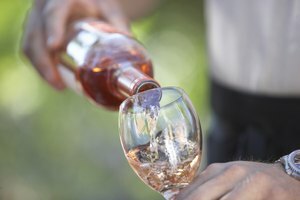 Wine stain removers are designed to work on fresh or dry stains in 20 minutes or less, although repeated applications may be necessary on set-in stains. If none of the stain-removing techniques proves sufficient, you may need to apply a stain-blocking primer over the affected area and then recoat the surface using the original paint. 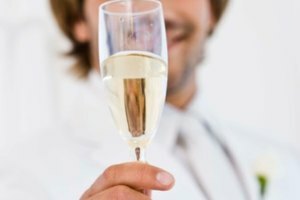 The next time you repaint the complete wall, select a high-grade eggshell, satin or glossy acrylic latex paint -- these coatings are tough enough to protect the wall beneath from wine and other fluids, which means that the simpler wine-removal techniques are usually adequate. A modern latex paint's color is impervious to the wine, and it does not fade when treated with household cleaning solution.